1 of 5 Heat oven to 450 degrees F. In a shallow dish, whisk whites and mustard. In second dish, combine cheese, cornflake crumbs, salt and pepper. 2 of 5 Coat cutlets with egg white mixture, then cheese mixture. 3 of 5 Coat a large baking sheet with nonstick cooking spray. Transfer cutlets to prepared pan; spritz cutlets with nonstick cooking spray. 4 of 5 Bake cutlets at 450 degrees F for 5 minutes. Flip over; bake an additional 5 minutes. 5 of 5 Whisk dressing and vinegar until blended. 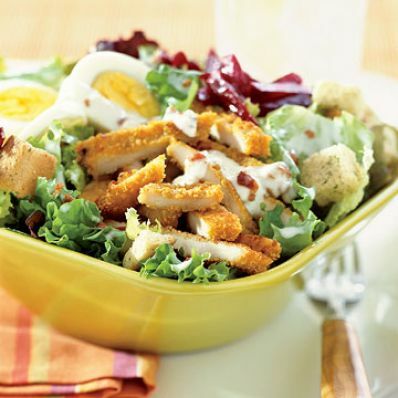 In a large salad bowl, toss lettuce, 1/2 cup of the dressing and bacon until well coated. 1 of 1 Slice cutlets into thin strips. Divide salad, beets, turkey, eggs and croutons among bowls. Drizzle with extra dressing.